No. 12 UCF’s run at a perfect season meets up with No. 7 Auburn on New Year’s Day in the Chick-Fil-A Peach Bowl. 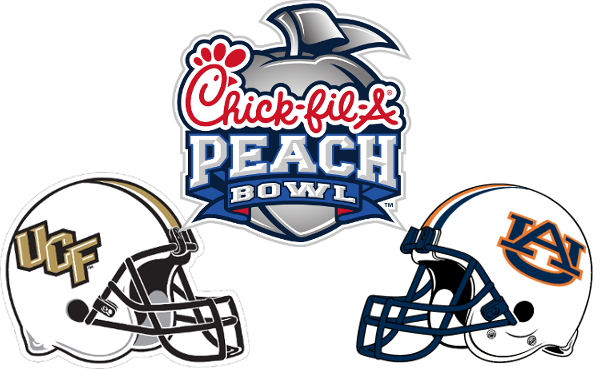 Coverage of the Peach Bowl airs on ESPN and the WatchESPN app beginning at 12:30 from Mercedes Benz Stadium in Atlanta, GA.
UCF probably hoped for better in the rankings after going 12-0 but now they have to cast that aside against Auburn (10-3) and play another strong four quarters. The Odds: The Auburn Tigers are 10 point favorites against the Central Florida Knights in the Peach Bowl. The over/under for this game is set at 67.5 total points. Will this be another game of SEC dominance or will UCF pull off an upset? Copyright © 2013 Tireball College Football News, Rumors, Gossip and Opinions. All Rights Reserved. Get e-mails from Tireball Sports now!